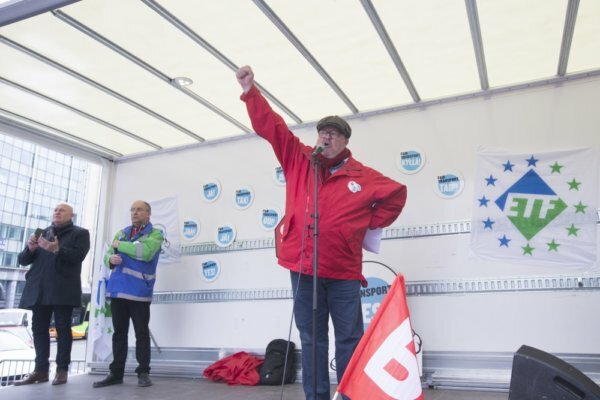 Our journey started with speeches by a wide range of affiliate unions in front of the European Trade Union Confederation (ETUC). 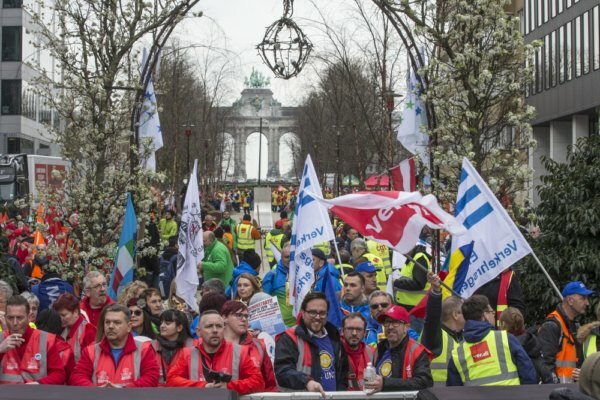 We then marched across the city to our rallying point in front of the European Commission. 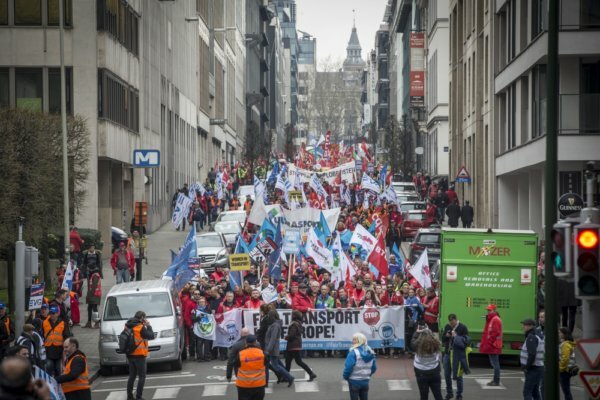 The EU district was blocked by our procession and they could certainly hear us too! 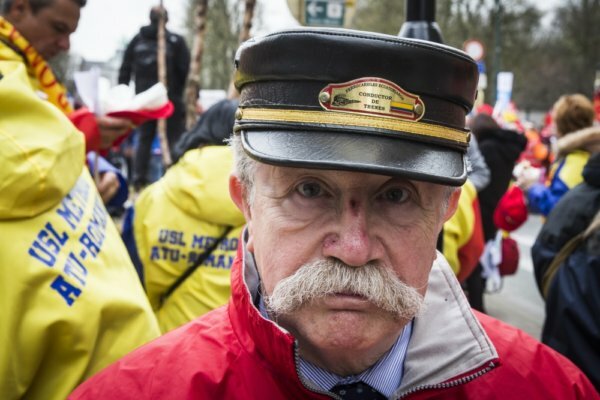 ETF President Frank Moreels, General Secretary Eduardo Chagas, and Steve Cotton, General Secretary of the International Transport Workers Federation, all addressed the crowd. 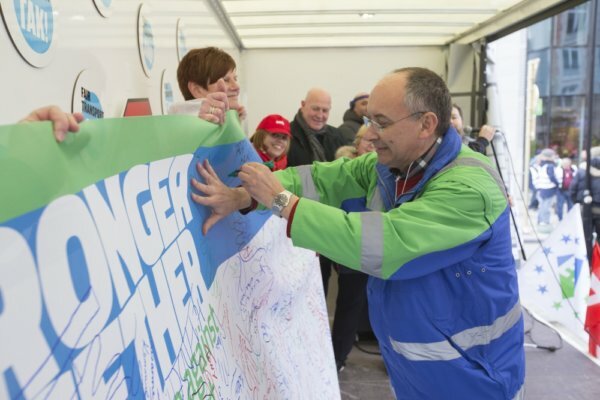 Meanwhile young workers gathered signatures for a postcard action against letterbox companies, and the ETF Women’s Committee filled a huge banner with handprints in support of their Stronger Together campaign against gender-based violence at work. We enjoyed solidarity from across the union movement. 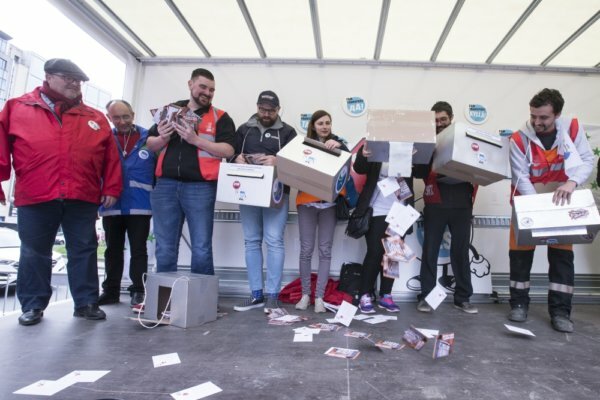 The ETUC and other sectoral European Trade Union Federations bolstered the demo with statements of support and feet on the ground. 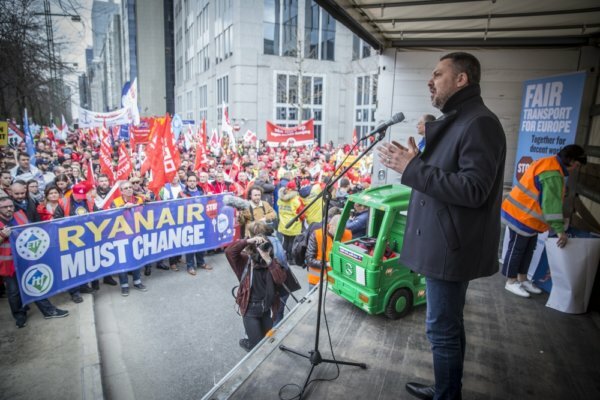 ETUC General Secreatary Luca Visentini spoke to the crowd before they set off. What a day, and what a campaign! Huge thanks to our affiliate unions large and small, whose mobilisation shows that our movement is united. 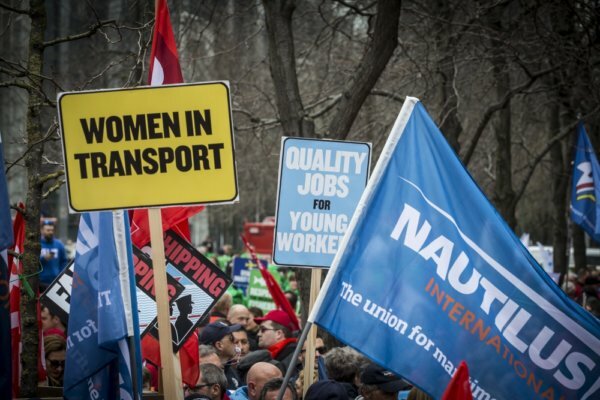 Together we can defend decent work in transport. 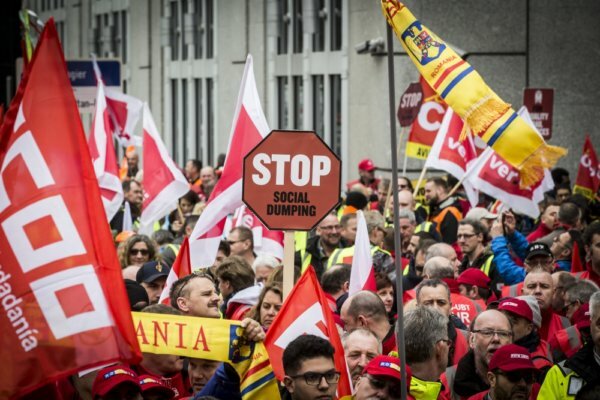 Together we can build a more social Europe. 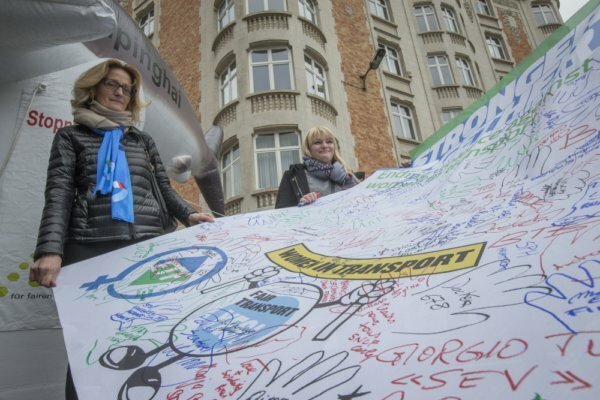 There will be a lot of photos in the coming days, and you’ll find many on social media if you look for #FairTransport. 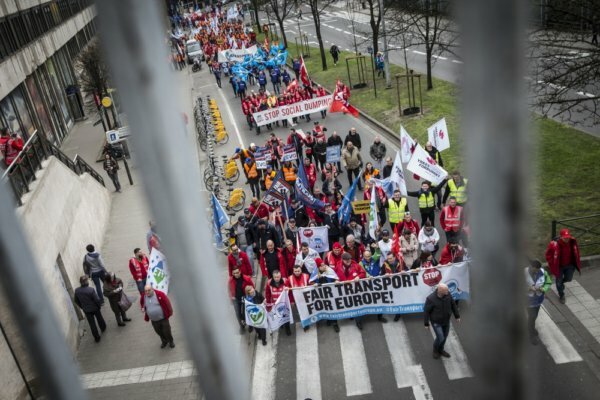 But here are a few impressions of a wonderful day for transport workers in Europe.